As part of the World Summit on the Information Society (WSIS) Forum 2017 The thematic workshop “Addressing the global e-waste challenge. 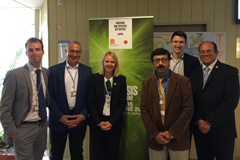 The Global e-Waste Statistics Partnership” was held on 16 June 2017 in Geneva, Switzerland. Moderated by the Executive Secretary of the Basel, Rotterdam and Stockholm Conventions, Rolph Payet, the event was organized by the International Telecommunication Union (ITU), the United Nations University (UNU) and the International Solid Waste Association (ISWA) to highlight current challenges in the area of e-waste and introduce the global e-waste statistics partnership. It was emphasized that we are facing a lack of data on e-waste since only about 40 countries in the world collect national e-waste statistics and there is an urgent need to build statistical capacities in the developing countries. In this regard coordination at the national level for establishing policy frameworks and data on e-waste is critical and it communication and ICT ministries should work with ministries of environment at the national level to produce better e-waste policies and data. For more information on WSIS and e-waste, please click here.